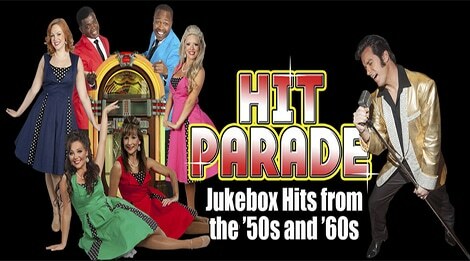 Hit Parade at The Grand Majestic Dinner Theater showcases jukebox hits from the ’50s and ’60s. 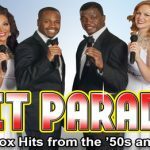 This Broadway style show features beautiful costumes coupled with precise choreography to energize familiar songs from the early days of rock-n-roll. 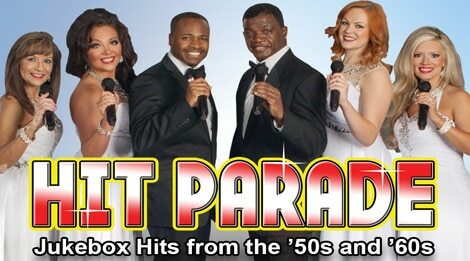 With a live band and state-of-the-art sound, this musical revue is sure to entertain old and young alike. The performance also includes a moving Military Tribute to the men and women of our armed forces. This unique, one-of-a-kind accolade to all five branches of the military is proudly presented with dignity and honor by the cast of Hit Parade. Dinner is served one hour before show time. 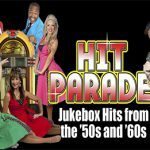 The Hit Parade menu includes Grandma’s Homestyle Meatloaf, Juicy Roasted Chicken, Creamy Mashed Potatoes, Seasoned Fresh Vegetable Medley, Hot Baked Dinner Roll, Specialty Dessert.